David E. Kimble and Minerva Jane Bozarth Kimble. Courtesy of Kimble descendant Judith Oldham. Kimble staked first Mount Vernon-area claim Our research into the life of Skagit valley pioneer David E. Kimble has led to the most vexing conflicts so far and it has taken five years to sort them all out. Many questions remain unresolved, but we think we now have a pretty good picture of him and his large, extended family. We have corresponded since 1999 with Judith Oldham, a great-great-granddaughter of Kimble, since 1999 and she was initially troubled that Kimble has rarely been given credit as staking the original claim as a settler in the future area of Mount Vernon. We hope to put that oversight to rest with this profile. Oldham presents evidence that makes her case very strong. Almost all the various history books and articles that address early settlement credit Jasper Gates and Joseph Dwelley credit because those two men staked claims on the acreage that later composed the nucleus of the city of Mount Vernon. We prefer to not get involved in the arguments about who was the "first" anything. Instead, we present the evidence as we find it, refer you to the sources and let you decide. We have learned by sad experience that settlers and their families made claims about being the first this or that and then we discover a newspaper from the time that disputes such a claim. However you look at it, Kimble left quite a mark on the Skagit river area from the time that he staked his claims in 1869-70 and thereafter until his death in 1908. During the period of 1870-78, when the two log jams blocked travel above the bend of the river south of Mount Vernon, his landing on the east side of the bend was the "end of the line" for many travelers. This is the portal introduction story to David E. Kimble. You will find links below to all four stories in the series and other stories that feature members of the family. We are updating this whole series this summer and in Issue 52 of our Subscribers Edition we featured an 1897 Supreme Court case brought by David's first wife. It reveals many details about their marriage and the actions taken by David and his second wife. Regardless of whether he was first to settle here or not, we do know from Kimble's own words that he staked a claim near the Skagit river on Feb. 3, 1869, and traveled all the way to Olympia to file the papers. In addition, the obituary of one of his children establishes an even early date for his first travel up the river: Jan. 9, 1869. Kimble wrote that he rowed upriver in a canoe and found the lower of two logjams that choked off further travel by boat. He may have come alone that first time or with a few of his neighbors from Whidbey island who joined him the next year in actually settling near the logjams. We suspect that he probably hired an Indian guide to help him find his way through a maze of sloughs that were hard to distinguish from the main north and south forks of the river. In April 1870, he and his neighbors and their families began arriving by sternwheeler to begin building cabins as the weather began to clear that spring. The most vexing problem stymied us for nearly five years. As we explained in detail below, various records present conflicting dates for when his family moved to Washington territory from Illinois. At first we could not resolve how one of his daughters, Minerva Elizabeth, could have been born in Illinois on Jan. 24, 1869, while David was out here exploring the Skagit area at the same time. We always assumed that he and his family came out here together, but we now think that David crossed the plains by wagon train in 1868 and that his family followed in the fall of 1869 via emigrant railroad train to San Francisco and then by schooner up to Whidbey island where his father-in-law, Urban E. Bozarth — often misspelled Urvan — was a key pioneer since 1858. We also want to note that we have been aided considerably in our research by family memories and transcripts of old records by Virjean Potter Bozarth in California and Debra Athon Mckim in Missouri. Where Kimble homesteaded and built his first Skagit house We do not know the exact acreage and borders of Kimble's initial claim, but from his description, other writers have assumed that it was centered on the west side of the river at what is now Edgewater Park. I respectfully disagree with the assumption that his claim centered there on what became West Mount Vernon. That area seems to have been the claim staked by Kimble's fellow Whidbey island neighbor, Augustus Hartson and later by Dennis Storrs. I base my opinion on several sources, including Kimble's biography in the 1906 book, Illustrated History of Skagit and Snohomish Counties. There, on page 528, he says his claim was "right at the lower end of the historic log jam which blocked higher navigation by any kind of a boat." That smaller logjam of two was at the southwest corner of Section 19, Township 34, Range 4. The bend of river was south of that in Section 30 and, because of the bend, a slough later named Britt's slough ran due south from the jam, through Sections 30 and 31, and curved west, back to the river. Earlier in the same 1906 Book, the lower jam is described as "beginning at the old Kimble homestead below Mount Vernon and extending up the river to a point about opposite the present Kimble residence, a distance of perhaps a mile." Researcher Tom Robinson believes that the later Kimble home in Mount Vernon proper was where the Interurban depot and later the Vaux Pharmacy stood at the foot of the revetment on the northwest corner of Kincaid and First streets. Robinson thinks that the border between the claims of Jasper Gates and Kimble was roughly at what was later platted as Pine street. Another tantalizing hint about the original Kimble home was in the third issue of the Skagit News newspaper of March 18, 1884, when editor William C. Ewing reported that "near Skagit City, burning of D.E. Kimble's 'old house on the island' removes one of the county's old landmarks." Here is another example that proves how much I still do not know about Skagit River geography. At first I inferred that "the island" meant Fir island; then I inferred that the 1884 writer meant some island that had formed at the forks of the river and had disappeared in the intervening 13 decades. Then author Tom Robinson remarked that from his research, he concluded that the original Skagit Forks Trading Post was on an island just north of the fork, which had a slough forming its north and west sides. I had assumed all along that such an island was the least likely answer for the original Kimble house. Then I started researching Skagit City and Skagit School for our ensuing section on that first city on the river and discovered in old documents that the original trading post was on Skagit Island. John G. Kamb Jr. took me for a tour of the area north of the forks and west of the river. There we saw the old "island," still set off by a row of trees along the old slough, east of the old Harmony District and School. Starting in 1875, LaConner pioneer J.J. Conner shipped coal ore down the river in canoes and after it was portaged around the two log jams, it was loaded onto the sternwheeler Chehalis at the bank below the jam next to Kimble's house. And in either 1873 or 1876, Harrison Clothier taught a three-month term at the area's first school, which was conducted in what is variously described as Kimble's barn, log stable or a shack at the bend. Finally, we have another tantalizing but confusing hint in Kimble's story of an Indian sham battle from the 1906 Book: "Just opposite the old Kimble home, separated from it by a narrow, short slough, a low, sparsely timbered and partly cleared point jutted out into the river." Unless the writer was referring to the Kimbles' first cabin on Skagit Island, to the southwest, this seems to refer to Britt's slough. Thanks to Mike Aiken of Mount Vernon, a descendant of Birdsey Minkler, we have confirmed, from his 1897 Corps of Engineers map of the Skagit river, that the river and Britt's slough did indeed border David's farm on two sides. His homestead stretched north all the way to the southern edge of Jasper Gates's claim. Ammons also found another fascinating detail about Kimble's life that has never been referenced before. She found a column in an issue of the Skagit News, which is unfortunately undated but looks to be from the late 1880s. For the first time ever, we learn that he moved to Canada for a considerable period of time. A Mr. T.E. Turner wrote: "[New] Westminster" is situated on the banks of the Fraser river, a nice place for a town. In Westminster we met Mr. David Kimble, an old settler on the Skagit, now residing ten miles from Westminster, down the north arm. Mr. Kimble has a large crop and gardens with vegetables till you can't rest." The Kimble family trek clear across the new nation began in 1802 and was completed in 1869. This terrific aerial photo is from the Washington Wildlife and Recreation Coalition website. The photographer was looking north from about the town of Fir and the photo shows the North Fork branching to the left and the South Fork flowing toward the viewer. The bend at Mount Vernon, where the upper log jam once was, is in the upper right background and the second Kimble farm and cabin were just south of the lower jam. Skagit City would have been in the foreground, just to the right of the fork in the present clump of trees. Skagit Island, where Kimble built his first house, is to the north of the forks and the beach on the river side could well be the general area where the first trading post was in about 1869. Also see this Google Map for the region of South Fork. You can zoom in to see more topographic detail. David Kimble's family in the East and Mid-West David E. Kimble's life is shrouded in mystery and conflicting statements that he and others made. His adolescence was marked by questionable decisions and intriguing alliances with women who may or may not have been his wives and whom he may or may not have married or divorced. Judith Oldham and I have tried our best to piece it all together from records and articles. David's father, Aaron Kimble, was born in New Jersey on Feb. 27, 1802, the second of five children. This family line probably descends from Caleb Kemble, who was born in London about 1728 and emigrated to New Jersey. Aaron's mother was born Martha Rose in a family that originally lived in Virginia, and she was a niece of Martha Washington. As a child, Aaron moved with his family, first to Pennsylvania and then to Ohio in 1814. After his father's death in 1816, Aaron was "loaned out to learn a trade," as David recalled in 1906, and soon became stone mason and plasterer. Although Aaron is not listed as marrying Nancy Snodgrass until 1827, Oldham found a note in the 1820 federal census that Aaron was listed as a head of household, living near Springfield, Clark county, Ohio, near the farm of John Snodgrass, an uncle of his future wife, Nancy. From this old record, Oldham infers that Aaron could have married one of John's daughters first — a cousin of Nancy. Nancy Snodgrass was born on Feb. 17, 1807, in Botetourt County in the western part of Virginia. Her parents were Joseph Snodgrass III and Catherine Gish. Her paternal great-grandfather immigrated from Londonderry, Ireland, and most of her ancestors lived in Scotland. She moved with her family to Ohio in 1826. After their marriage in 1827, .Aaron and Nancy Kimble settled in Fayette County, Ohio, near a George Kimble, who may have been a relative, and Aaron's brother Nathan joined them there by the time of the 1830 census. Aaron and Nancy moved to Parke county, Indiana, near Kokomo, in 1833 and then emigrated to Scotland County, Missouri, near the town of Memphis, in 1841. You will read a lot of references to Scotland county in this story and Oldham warns that sometimes the family stories confused Scotland county with Adrian county, which was next door to the east. Back in Ohio in January 1833, Aaron's sister Mary "Polly" Kimble married Nancy's brother John, producing double cousins down the line, and they also moved to Scotland county. David recalled that this area in far-north Missouri, near the Iowa border and just west of Keokuk, was still wilderness back then. Scotland county was formed in 1841, one of four counties carved out of the larger Lewis county. Aaron Kimble died there on Nov. 10, 1845, after he and Nancy had nine children together. The last one, Clarinda, was still a baby. The next 17 years of David Kimble's life are a blur. In a 1906 letter to his grandson Jesse, he summed it up it one sentence: "I lived there [Missouri] until the War." He went on to say, "Then persecution drove me from home, and I became a rambler. I went from place to place. Finally I went to Indiana." He never explained what the persecution was, but he implied that this changed when he moved to Indiana and married Minerva Jane Bozarth. But that was cover for another experience. Sometime in 1846, David traveled to Cass county, Illinois, about 100 miles to the east, maybe to build a house. There he apparently met a young woman named Catherine Post. We know very little about her and there are indications that she became pregnant and had a baby girl named Mary. Those are the only details that Judith Oldham has found; she has never found any records of marriage, but Catherine and Mary have appeared on family trees that have been passed down the line. First wife: Rebecca Wortman Freels — 7 children By 1850, David appeared back in Scotland county where the federal census recorded him that June as being the head of a household. His wife was Rebecca Wortman, the daughter of Rev. David Wortman, and the two families were living next door. The reverend was born in Nova Scotia and then emigrated to the U.S., preaching across the known country at the time and winding up in Iowa in the early 1840s, where his daughter Rebecca married Elisha Freels in 1845. When her husband died sometime later that decade, Rebecca moved with her toddler daughter, Meg, to Adair county, Missouri, where her father had moved to preach, just northeast of Scotland county. She met and married her father's next-door neighbor, David Kimble, in 1847, information not available in the family tree; they married on December 20. Oldham has never found an actual wedding license. A daughter, Mary, was born in September 1848. There is some question as to whether Freels or Kimble was her natural father, but we tend to think that it was David Kimble. More children followed from 1854 on, one every two years. In 1857, David bought three farms in next-door Adair county, totaling 200 acres, and all the children by Rebecca were probably born in that county. Two years before, on April 22, 1855, David's widowed mother, Nancy Snodgrass Kimble married Dr. William Brice in Adair county. And in 1857, they bought a 40-acre farm together, where they lived until 1870. Meanwhile, David's younger sister, Clarinda, married a farmer named Jasper Gates in Kirksville, Missouri, on Oct. 6, 1860. Ten years in the future, both the Brice and Gates families would be David Kimble's neighbors on the Skagit river. Although David glossed over that period of the 1850s in his 1906 letter, his life in that period seems to have been stable as a farmer and a father. It probably was until the Civil War started brewing in 1861 and David's life was turned upside down. When the war broke out in April, the family was located in Adair county between neighbors who had sympathies both ways and guerillas staged raids in the area and forces from both the Union and Confederate side pressured men to enlist, resulting sometimes in brothers choosing sides against each other. In the 1906 letter, David describes that period as: "Then persecution drove me from home, and I became a rambler. I went from place to place. Finally I went to Indiana. There I met and married Minerva Jan Bozarth who has shared my hardship for nearly 40 years." Oldham's family memories from her grandfather Jesse and others hint at what the persecution was: "David, according to family legend, deserted both the Union and Confederate armies during the Civil War. The War was very difficult in the area in which he lived. Both Union and Confederate forces, as well as guerilla raiders, were in the area." This family story is undocumented and may have been the result of rumor from relatives who were angry with him for abandoning Rebecca. We do know that David's brother Newton enlisted in the Ohio Volunteers on the Union side. David's brother-in-law Jasper Gates enlisted in the 27th Regiment of Missouri Infantry for the Union side and became a distinguished sergeant, seeing in action in many battles and participating in General William Tecumseh Sherman's march to the sea in Georgia. David's son John Aaron Kimble recalled years later that, at one point, he saw his father hide his guns in a hollow tree stump on the family farm and that, part of the time, David hid under the house. John remembered peeking under the house at his father during one such roundup. While on the run from one side or the other in 1862, David hid out at the farm next to his, which was owned by Urban E. Bozarth and his father, Andrew Bozarth. Urban had moved to the West Coast with his son Tom in 1854, leaving behind two daughters with their grandparents. The eldest daughter, Minerva Jane, caught David's eye and one thing led to another. His wife, Rebecca, was a few miles away with six children and pregnant with another, but it is unclear if David ever lived with Rebecca again. Within a few months, Rebecca was history and, Oldham says, some family stories hint that David was effectively tarred and feathered and ridden out of town on a rail. So we now understand what the persecution was all about. Update: We subsequently discovered an 1897 lawsuit from the Washington Supreme Court, wherein Rebecca sued and won a judgment after David and Minerva sold property in which Rebecca claimed an interest as David's legal wife. See the main Kimble links for a transcript of the complete case. It provides many details about David and the family. Keep in mind that David and Rebecca had seven children together and complications did proliferate out in Washington Territory. Second wife: Minerva Jane Bozarth — 12 children Minerva Jane Bozarth was born on Feb 2, 1841, in either Boone or Holt county, Missouri, the second child of Urban E. and Elizabeth (Rice) Bozarth. She had an older brother, Thomas J., who was born sometime between 1838-40 in the same area. A younger sister, Mary Etta was born in 1850 in either Missouri or Louisville, Kentucky, the confusion about birthplace due to conflict between the family tree and Mary Etta Bozarth Bartl's obituary in Clear Lake, Washington, in 1919. Elizabeth died sometime between 1851-54 and around that same time, Urban and his children moved to Adair county, where his father had moved in 1831, after the death of his first wife. 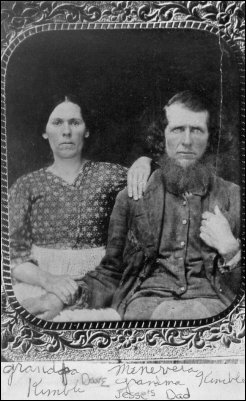 In 1846, Andrew married his third wife, Priscilla Jackson, and they became babysitters as Urban farmed in Adair county. Located near the jumping-off point for the Oregon Trail, Urban heard a lot of tales about the 49er gold rush country out in California and by 1854 the gold bug bit him. On June 1, that year, Urban and Thomas, joined a wagon train with their neighbors, the Jacob Ebey family, who were traveling to Washington territory to join Jacob's son, Isaac Neff Ebey, the first permanent homesteader on Whidbey island. Urban and Tom chose instead to branch off and head for California, and then joining the Ebeys four years later in 1858. At age 20 in 1861, Minerva Jane was of very marriageable age. Although her grandparents may have had misgivings, she soon went down the road with David and was very pregnant. By March 18, 1862, David and Minerva relocated to Springfield, Illinois, where his uncle Joseph lived. Springfield was the state capitol, located in Sangamon county, just east of Cass county, where David started his first family 16 years before. We know that date because it is the recorded birthdate of their first child together, David Edward Kimble, who died in Sedro-Woolley in 1943. From hereon, we will refer to him as Edward Kimble, the name he went by, to distinguish him from David E. Kimble. Several moves followed over the next year or so. David E. Kimble recalled that in December that year, they were living in an unknown town in Indiana where he ran a sawmill engine. We know that his aunt Mary Snodgrass Pitzer, lived in Pike county, Indiana. Meanwhile, on Oct. 12, 1862, back in Scotland county, Missouri, Rebecca gave birth to the last of the couple's seven children together, a son whom she also named David. It is possible they eloped to Indiana because of David's decision to hide from military service. Virjean Potter Bozarth surmises that Minerva and David left Adair County permanently just before or just after the Battle of Kirksville of Aug. 6-9, 1862. We know very little about David and Minerva's time together after they moved to Illinois sometime after 1863 — either Cass county or Springfield, except that they had two more children there. A girl, Balzora, was born in 1863, and a boy, Charles W., born in 1866; they both apparently died as infants or toddlers. Virjean Potter Bozarth found a letter from Andrew Bozarth to his son, Urban, dated June 15, 1864, in which he mentions that he had not heard from Minerva Jane since she left with David to Indiana in 1862. The 1880 federal census of Washington territory indicates that they were in Illinois between 1863 and 1869. Oldham found in various records that David developed skills as a wagoner in those years, the trade that would become known as teamster. By 1868, Urban had written glowingly of the prospects of Washington territory long enough and often enough that he convinced David and Minerva and Jasper and Clarinda Gates that they should consider moving to Puget sound. As Seattle and other cities on the south sound grew and as the Skagit valley attracted settlers, David's skills as a farmer and with machines would be needed and highly valued. After marrying Jacob Ebey's widowed daughter, Mary Wright, in 1858, Urban had bought 120 acres on Whidbey island. He bragged about the temperate climate that brought forth crops every year and the timber stands that stretched on for miles along the waterways. The record is slim for the next year but this is what we surmise may have happened. There was no transcontinental railroad to the West Coast yet, so sometime in 1868, 40-year-old David probably joined a wagon train headed west from St. Joseph. Maybe even more important was that he would get away from the "persecution" for having abandoned his wife and his desertion from one or both armies. The magnet for well over half of the settlers of the Northwest was twofold: to get away from something back home and/or establish a new life and career on the frontier. Whatever troubles David encountered in his first 34 years, his life with Minerva Jane seemed to represent a fork in the road and he chose the more peaceful high road. The Kimbles carve out a piece of the Skagit wilderness That brings us around full circle. We think that the Skagit river bug soon bit David E. Kimble just as the gold bug bit Urban E. Bozarth 14 years earlier. David talked to the settlers who made initial forays into the Skagit delta in the late 1850s and 1860s, and maybe he met Michael Sullivan and Samuel Calhoun, the first settlers to cultivate crops in the marshland near Swinomish slough. He probably then hired an Indian guide in January 1869 to row him up the Skagit river where he found the log jams above the forks and beside them there was beautiful farmland ripe for the picking. After two trips in January and February 1869, and after traveling to Olympia to file his claim, all David had to do was to somehow get Minerva and the children out to join him. She was pregnant when he left and on Jan. 24, 1869, back in Illinois, daughter Minerva Elizabeth was born. David probably remembered how arduous his own journey by wagon train across the plain was and he knew that a similar trip would be a terrible strain on Minerva. Then, in the spring of 1869, the news traveled north from California that the Central Pacific and Union Pacific lines drove the golden spike at Promontory Summit, Utah, on May 10, 1869, to link up a transcontinental rail line from the Midwest to California. The Union Pacific began its part of the route at Omaha, Nebraska. The Central Pacific built east from Sacramento. In June that year the San Francisco and Alameda railroad rushed construction of a line that would connect Sacramento with the San Francisco Bay by rail and then a ferry would carry entire trains across the bay. The first through train arrived at Alameda on the East Bay on Sept. 6, 1869. We know from family records that Urban E. Bozarth returned to Missouri and Illinois in 1869 to gather together his daughters' families but we have no idea if David accompanied him. His youngest daughter, Mary Etta Bozarth, had married Xavar Bartl in Missouri in 1865. By that time, Minerva and David had three children together and she was pregnant with her fourth. In interviews with Bartl descendants, Clear Lake historian Deanna Ammons discovered that Urban organized the Bartls and then Minerva and her children, along with Joseph Bozarth, who decided to accompany them. Just before they all left, David's youngest sister, Clarinda Kimble Gates, paid for a stone marker on her grandfather Aaron Kimble's grave near Memphis in Adair county. The combined group originally brought their goods overland from Illinois through Missouri by wagon train and apparently boarded the Union Pacific at Omaha. Urban objected to the early version of the emigrant train because the second-class fare required families to ride in the same boxcars that held their furniture and livestock. Urban apparently had just enough money to arrange for the families to ride in a coach car. They all traveled west as what Kimble's great-granddaughter Irene Windish [who died at age 95 in July 2004] described as a "gypsy band" in an emigrant rail car on the Central Pacific railroad. Minerva told Irene that she dressed as a gypsy and told fortunes for cash when they laid over in small towns; she was pregnant with Irene's mother, also named Minerva. We date the families' travel after September 1869 because the family record shows that they traveled all the way to San Francisco by train and then boarded a sailing ship for the rest of their travel north. The Kimbles settle on the east bank of the Skagit The families then congregated at Urban's farm near Penn Cove on Whidbey island. In several trips by sternwheeler during 1870-71, they moved over with other families, including the Hartsons, Dwelleys, Washburns, Lannings, Gages, Fords and Tom Bozarth, who had also married in 1865. The first move by the families was in February 1870, when they chartered the little sternwheeler Linnie for $50 to bring them and their household goods from Whidbey Island to their new homes, which we assume that the men had built in the year before. David Kimble's farm at the bend of the river became the natural crossroads for travelers to and fro on the river, and for mail and supplies to be dropped off for portage overland around the jams. 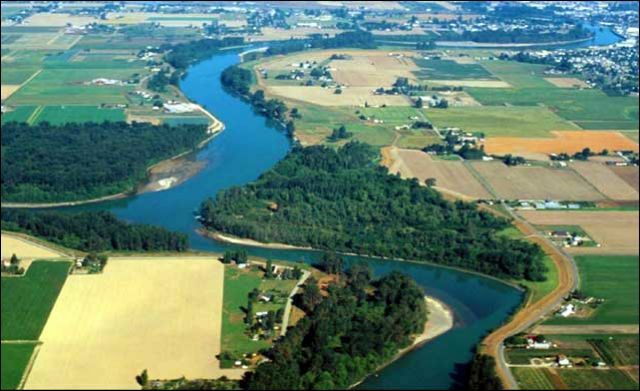 The initial villages that grew on the river formed at Skagit City and at Mann's Landing, south and west across the bend. Mann's Landing evolved into Fir and Conway on opposite sides of the south fork. Jasper Gates and Joseph Dwelley possibly had more of a vision for a future metropolis, however, staking out claims on what became downtown Mount Vernon seven year later, and thus they got almost all of the credit for being the first settlers near the jam. David's mother, Nancy, and her physician husband, William Brice, emigrated to the Skagit river sometime in 1870, when she was 63, and they invested in land on both sides of the river. Their piece that was located on the west side of the river was where West Mount Vernon would form in the mid-1880s. A piece of land north of downtown Mount Vernon was where the first cabin was built and where a logging camp was centered. David's younger brother Joseph settled somewhere between David's farm and Mount Vernon and he shows up in the 1880 federal census. The extended Kimble family experienced its first death in 1870 when Urban E. Bozarth died very unexpectedly, maybe as a result of the strain of moving the families. On St. Valentine's Day, Feb. 14, 1870, he was apparently in very good health and attended Sunday church services on Whidbey, when he fainted and soon died of apoplexy. David's daughter Mary married William Miller back in Adair county, Missouri, in 1866 and they moved out to the Skagit valley with their three children in 1874. That was also probably when her younger brother Charles Henry came to the valley. They were the only children by Rebecca Wortman that came to Washington while their father was still alive. Charles Henry married Clara Ford on Aug. 30, 1876. She was just barely 13 and the daughter of the Levi Ford family, which came to the valley from Whidbey in April 1870. Charles and his offspring confounded us early on in our research because they spelled their name as Kimball. We finally determined the reason for the name change when Deanna Ammons found a copy of David's will, which he made out in 1905. The father and son's mutual enmity was illustrated when David willed Charles only one cent and forbade him to attend any future funeral service for his father. Charles Warren Kimble, one of Charles Henry's children, was correctly identified in a 1947 Mount Vernon Herald story as the first child to be born in the Mount Vernon area and he was profiled as always being a Kimball. In William Miller's profile in the 1906 Illustrated History book, we find that Mary also declared her maiden name to be Kimball. By 1873, there were enough settlers in a radius of several miles around Kimble's farm that they needed a school, so David converted part of his log stable to become a classroom that fall after the harvest. This has mistakenly been noted as the first school in the area that became Skagit county ten years later, but it was actually preceded by a school on the William Munks ranch on Fidalgo island in 1868-69, and another on the mainland itself, located in the original log cabin of W.H. Sartwell near Mann's Landing on the south fork of the Skagit. Harrison Clothier, the future founder of Mount Vernon, was a schoolteacher in Wisconsin and Minnesota before he arrived in the Skagit valley in 1875. In 1876 he taught a three-month school term in that same Kimble barn. David's farm proved to be a most advantageous location starting on April 22, 1875, when the partners of a coal mine located across the river from Hamilton began shipping ore. They shipped it downriver on crude barges rigged from boards suspended between two Indian canoes. At some point around the site of future Mount Vernon, teams of Indians unloaded the barges and loaded the ore onto sleds that they drug down to Kimble's farm, where they loaded it back onto the sternwheeler, Chehalis, and other subsequent steamers. [See this Journal website for the complete coal story.] A Bartl descendant told Deanna Ammons a humorous old family story that displays David's wily side as a trader. Lavanchie Bartl Gormley said that David would insert a section of wide stovepipe in the sacks of potatoes that he sold — a very valuable commodity in those early days. He would put all the small and undesirable potatoes at the bottom of the pipe and cover them with the finest specimens. Mount Vernon is born, 1877 When Ed English and Harrison Clothier founded the town of Mount Vernon in the spring of 1877, David's mother, Nancy Snodgrass Kimble Brice, made her own mark on Skagit history. For the Fourth of July celebration that year, she and Minerva Jane Kimble led a team of local women who sewed the flag with 38 stars that was hoisted from a tall cedar tree near the Clothier-English general store. That flag waved proudly there for 14 years until the fire in 1891 that leveled most of the downtown area. It is today displayed at the Skagit County Courthouse. Local histories have never pointed out David E. Kimble's paternal relationship to Martha Washington, the first lady of both the nation and of the Mount Vernon plantation in Virginia. A black wool shawl is displayed at the Skagit County Historical Museum in LaConner and a placard states that it is a shawl of Nancy Brice that was donated by her granddaughter, Martha Gates Parker. Keeping to the middle of the river and maintaining a sharp lookout for jams and snags they made good time and arrived safely at Skagit City in time for the party. The distance would be about twelve or thirteen air miles, and how far by the windings of the Skagit River would only be a guess. At a ramshackle building passing for a hotel these company-starved pioneers had a gay time dining and dancing, the memory of which would brighten many a gloomy, monotonous days in the future. The Van Fleets had planned to spend the remainder of the night at the hotel, but David E. Kimble, who had a homestead at the lower end of what had been the Big Jam wouldn't hear of it. "Just follow us home in your canoe and spend the night with us," he invited. After a pleasant night and visit with the Kimbles they went out on the not-so-easy canoe trip back up the tree-lined Skagit glowing with recollections that would last for a lifetime. See this Journal website for the rest of the story. 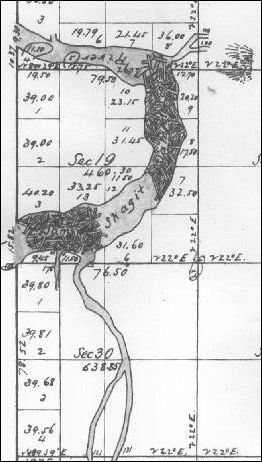 This map, courtesy of Larry Kunzler, with a view looking north, shows the location of the log jams in the Skagit River near future Mount Vernon, as drawn by surveyors sometime before 1877. Does anyone know the name of the creek entering the river from the northeast? The stream entering the river from the south on the map would later be named Britt's Slough. David Kimble's was just to the southwest of the bottom of the map. We know that by 1884, David and Minerva had moved with their younger children to downtown Mount Vernon. Tom Robinson places their next house at the northwest corner of Kincaid and First street where the Interurban depot later stood, starting in 1912. In the 1870s and '80s, Kimble sold off parts of his original homestead that stretched up to about Pine street. He sold part of his claim to Xavar Bartl, who had married Minerva's sister, Mary Etta, back in Missouri. Bartl's house was where the ballpark and the fair grounds now stand. The couple sold their Mount Vernon house in the spring of 1884 and moved to Clear Lake, where their son platted the town of Mountain View [soon renamed Clearlake] in 1890. Capt. David Decatur bought the chunk of David's property below Pine street and planted a large garden between Kincaid and Broadway streets. His son built the Lincoln Theater complex between Pine and Kincaid streets in 1926. Eight of David and Minerva's 12 children together were born after they moved to the Skagit river, from Elsie in 1870 to Harry, Annie and Rufus, who were all born after their parents moved from the river bend to Mount Vernon. We know very little about those children, but all of them except for daughters Xenia and Elsie were alive when David died in 1908. Their daughter Ida, born in 1975, became a socialite in October 1891 when she married John L. Anable. He and his brothers Charles and Niles had a variety of businesses including a grocery, ice cream shop and the Opera House, and John was secretary of the first county fair in 1895. The only other child that shows up in the records is George Thomas Kimble, who was born in 1879 and married Elizabeth "Liddie" Fangmire in an unknown year. We know that George died here in 1926 but we have no death record for Ida, John or any of the other Anables; we hope that a family descendant will share some details. We settled here when there were only 16 (settlers), including me, in the county, and nary a white woman. We were surrounded by all sorts and sizes. was a sample William Penn. I made my friends and I never had any trouble. We had hard times, and ups and downs, (but) we have always worked hard and pulled together. We have never had a quarrel in all these 45 years. We have a good home and are enjoying life as well as two old folks can. We are both enjoying good health. Rebecca died back in Toledo, Ohio on Nov. 1, 1910, at age 86. The family are members of the Baptist faith. Mr. Kimble is a Democrat, but of late has not taken as active an interest in politics as when he was younger. He has served upon the local school board and in many other ways shown his public spiritedness and a desire to bear his responsibilities as a good citizen. The Kimble ranch of seventy acres is well improved and having upon it more than 1,000 bearing fruit trees is a high testimonial to its owner's thrift and taste, and it is appropriate that he and his wife should now be enjoying the fruit of their long, weary labors as pioneers of that community. David E. Kimble died of peritonitis and other complications on May 2, 1908. He wrote a will in 1905 and when it was read, the family discovered that he had left Charles Henry one cent and the rest of the surviving children of all three families one dollar apiece. The rest was left to Minerva. She died 16 years later in Snohomish on May 26, 1926. Both are buried in the IOOF cemetery on the hill above Mount Vernon. David E. Kimble was just as important to the settlement of the Mount Vernon area as ws Jasper Gates. Read about his rambunctious family in our extensive research. A collection of documents, obituaries and letters that profile David Everett Kimble and his family. Charles Kimball, born to a disowned Kimble son on the site of Mount Vernon's present bus station, he was the first settler child born in the city. The tumultuousClara Kimble Drown and the Kimble/Kimball-name mystery. Obituary of Ed Kimble, longest-living Mount Vernon pioneer who later lived in Sedro-Woolley. In 2010, we will post a story based on our exclusive research with descendants about Urban E. Bozarth, David E. Kimble's father-in-law and Whidbey island pioneer. A 1940 story about the initial wave of settlement in 1870 of the area that was to become Mount Vernon. David E. Kimble and Mrs. S.C. Washburn wrote letters in 1884 to the new Skagit News newspaper in Mount Vernon in November 1884, giving first-hand details of the arrival of the settlers to the future Mount Vernon area in 1869-1871. Read about Skagit City, where settlement of the Skagit River region began, and about the July 22 annual picnic at the 1902 Skagit City School on Fir Island. Harrison Clothier and the birth of Mount Vernon. Part II: businesses of Clothier and his partner Ed English. Part 3: The kidnapping of Ed English. The photo at the top is the only photo scan we have of the Kimble family. We hope that a reader will share scans or copies of other photos of the family or their homes.